Liquid Roof; The only Liquid EPDM Rubber Made. There are numerous liquid products on the market for RVâ€™s and they generally fall into three categories, acrylics, urethanes and elastomerics. Many of us probably are most familiar with elastomeric since we have already tried them. Accelerated age testing was done on all three against Liquid Roof and when the results came back; Liquid Roof outlasted all of them 4 tomes longer. The reason is simply that Liquid Roof is EPDM http://en.wikipedia.org/wiki/EPDM_rubber an extremely resilient and durable material able to stand up to the most extreme conditions and climates. Throughout its twenty five years thousands upon thousands of customers have benefited by this one coat application. There are over 40 videos of satisfied customer on our YouTube Channel. http://www.youtube.com/user/epdmcoatings?feature=watch . Listen and you will experience first hand from customers who have use other products less costly only to discover after a year or two their elastomeric coating had cracked. If that is your situation not a problem you can still take advantage of all the benefits of Liquid Roof but first you would need to apply our ProFlex primer over any other type of coating. If you have your original roof then it is simply a one coat application. Even if your roof is down to the black or even the wood you can still apply Liquid Roof. Some RV repair shops will tell you that you need a new roof. That your roof is too far gone. Well we happen to know firsthand of RV units that are down to the wood and go in for service and what do the RV shops do? They apply Liquid Roof. Save yourself literally thousands by this one coat application. The history of its success to date is in the curing process. A catalyst is added to the material that starts the chemical reaction and as the product cured any air that is between the base roof and the coating is forced to the surface. This leaves our customer with an airtight seal. Try finding another product able to make that claim. Other RV coatings dry very quickly and trap air this eventually gives way to cracking and within 3-4 years the RV owner needs to recoat their roof. It is the only material to take ponding water all year and to waterproof immediately on application so if you just get finished applying the Liquid Roof and it starts to rain there is no need to worry. Your leaks already fixed. In fact if the ponding rain water gets above 55 degrees it will even start curing underwater. 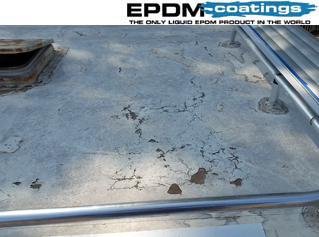 Since Liquid Roof only needs one coat our customer save time and money and because itâ€™s EPDM your one coat application is expected to last 15-18 years. As we said earlier the only time you would need the ProFlex primer is if you had put on another roof coating or if you have an â€œAlphaâ€ type rubber roof; Fleetwood is Alpha for example. For any metal, foam or rubber roof just one coat and you are done. Regarding try times; it normally takes about 25 hours above 50 degrees for the material to develop a skin and then 7 days for a full cure. Should the temp drop below 50 you would need to add that time to the overall cure. So for example if it drops below 50 degrees over the next 15 hours add 15 hours to the overall timeframe. The higher your daytime temperature gets the quicker the material will dry. If you get an unexpected shower no need to worry. Also in the event of that unexpected shower the product is already waterproofed. In fact that ponding rain water will even start curing underwater!. Note that once you mix the catalyst you have approximately a 2-3 hour pot life depending on your daytime temperatures. The higher the temperature the less pot life you have. During your initial cleaning of your RV you may wish to consider adding 2 cups of bleach to kill any surface mold/mildew along with a standard detergent such as dawn dish washing detergent or Simple Green. You will want to be sure that any oils or fats are removed as they will cause the existing epdm roof to swell. That swelling most of the time will go down but in some cases it will not and that is not covered under warranty. Applying one coat of the proflex primer will alleviate that issue. Not damaged by temperatures as low as -40 and is extremely flexible. Liquid Roof is specifically designed for RVâ€™s trailers and mobile homes, vehicles that are in motion. The commercial product LIQUID RUBBER is used for pretty much any application. For example canvas, plywood, concrete and non-porous brick, tiles, industrial application, potable water, coatings storage containers, and so much more. After you have applied the Liquid Roof we suggest a couple times a year cleaning your roof with a soft brissle brush and a mild detergent. Even Dawn dish washing detergent is sufficient. The common cause of roof damage is by drivers backing up into overhangs and branches. Be sure you have a clear path when you get to where you are going. A simple clearance check will save you a few hundred dollars.